Categories: Watercolor, Challenges, Handmade Cards, Coloring, Embossing, Hero Arts, anything goes | Tags: Hero Arts, embossing powder, Thanks, Stamp and Cut, Lucky Star, Intense Black Ink | Permalink. Aloha and happy Friday friends! I’ve been loving the latest Stamp and Cut sets with Hero Arts and wanted to play with the Hero Arts Layered Topiary Stamp and Cut. Such a fun, easy and versatile stamp set. I’ve made a bunch of thank you cards, but definitely thinking of adding a birthday sentiment instead or an “I love you” sentiment perfect for this month’s challenge! I initially started with the center topiary using Distress Oxide inks in Twisted Citron, Cracked Pistachio and Lucky Clover for the leaves and Vintage Photo for the trunk. I wanted to play around with just using a single ink color and it still looked cool so I decided to stamp out a couple more topiaries on each side. For more dimension I die cut the topiary to pop it up and added some score lines to ground my topiaries. The beautiful font on the sentiment is also from the same set! Wishing you all a fabulous weekend! Mahalo for stopping by!! Are you on social media? We are! Please join us on Twitter, Instagram and Facebook?so you don’t miss any fun promotions or new challenge announcements! The a2z scrapbooking store carries a wide variety of Hero Arts products! Get discounted new releases, sales, grab bags & more. Proceeds from our store benefit Celiac & Behcets disease foundations. Use my discount code NICKI15 to get 15% off your purchase of $25 or more. If you’re looking for a Hero Arts product you don’t see in store, use the Request Custom Order button from within the shop. Categories: Handmade Cards, Hero Arts, Thank You Cards | Tags: Distress Ink, Niki G., Stamp and Cut | Permalink. Hi, friends, it’s Chark here today to share not one, not two, but three mermaid cards made with the new Mermaid Stamp & Cut. It’s a smaller set of stamps that comes with two dies for $14.99 and is just so much fun to color. The first thing I did was to break out the new liquid watercolors from Hero Arts. I have the Deep Ocean, Strawberry and Dandelion colors. I saw this video from Jennifer McGuire and decided to give her technique a go. I used both watercolor paper and Bristol smooth paper. I watercolored a base blue on the Bristol paper and then dotted the yellow and blue paints directly onto the dried paper. I sprayed with water from above until it moved around just a little and let it air dry. That background became this card below. I used a new branch die and the Mermaid Ombre sequins to make a kind of coral reef thing for her to rest on. I used Prismacolor pencils to color all the mermaids. For this next card, I used watercolor paper and wet the whole paper a ton and then used the blue and yellow droppers to drop color in puddles onto the paper. I tipped the paper and let the colors run together. After it dried, I spritzed with water and then soaked up the color. I added some Mermaid Ombre sequins and clear Nuvo drops as bubbles. For my last card, I used smooth Bristol paper and sprayed it with water until it was saturatedand then dropped color onto it, still using the blue and yellow. I did move the paper a little to get some variation in color (where the pigment runs a bit) but not too much. I added Diamond Stickles as bubbles on this one and added a strip of washi tape at the top. I still have tons of papers left to use as backgrounds or for die cutting and still have plenty of watercolor left in the bottles for using as regular watercolors if I choose. Hop on over to the store if you’d like to try the new watercolors or this cute Mermaid Stamp and Cut set. If anything is sold out, just hit the Custom Order button and order any of the new Hero Arts products at no additional cost! Categories: Handmade Cards, Hero Arts, Watercolor | Tags: chark, liquid watercolors, mermaids, ocean backgrounds, Stamp and Cut, Watercolor | Permalink. Hi, it’s Chark here today sharing the cutest gingerbread boy and cocoa mug stamps from Hero Arts. I love anything gingerbread, from the cake to cookies to the adorable stamps this time of year and the wallpaper on my phone! So, of course I had to have the Santa Snacks Stamp & Cut set when I saw it. While I didn’t use the “mad” gingerbread boy with the bite out of him, I love him and will be using him in some fashion this holiday season…probably on a tag of baked goodies. With this stamp and cut set, I made a large tag for the holiday and a shaped card. I cut out the largest ornament in white and kraft with the Hero Arts Ornaments Infinity dies and then stamped with Distress Oxides. They give a cleaner stamped image than the Distress Inks and you can use water on them too to color the image like I did on the white ornament card. Here’s a closer look at each ornament. I used a white Prismacolor pencil and a white Uniball pen, along with a couple other Prismacolor pencils. Happy Coffee Hopping, my caffeinated friends! Enter your coffee/tea/cocoa project to try to win from a2z Scrapbooking and LOTS of other companies! And if you want to see another project using this stamp set, check out Cindy’s adorable gingerbread step card here. Categories: Christmas, Coloring, Handmade Cards, Hero Arts | Tags: chark, coffee hop, gingerbread boy, santa snacks, Stamp and Cut, winter 2017 | Permalink. Hi friends, Kristina here with a birthday card using a fun new Hero Arts stamp & cut. I was super excited when I saw this release, how cute is this stamp set? I love that you get multiple face options depending on your mood, two different girls and a ton of fun sentiments! For my card I die cut a rectangle postage stamp and stamped my images, then colored with Zig Clean Color Real Brush pens. I die cut the skirt, and made little folds along the embossed lines made from the die. For my background piece I stamped the Hero Arts Confetti background stamp in Tide Pool ink. After assembling everything together, I mounted it onto a white a2 sized card base, and added some wink of stella fun all over her skirt. Below I’ve linked all supplies used here, most can be purchased in the a2z scrapbooking store AND hows about 15% off?!? Just use my code KRISTINA15 at checkout on orders of $25+. Looking for something you don’t see in the store? Use the request custom order button to make a special request. Categories: Birthday, Handmade Cards, Hero Arts | Tags: Confetti, Dress Up, Kristina, Stamp and Cut | Permalink. We are coming to the end of December and that means you still have time to enter our “Anything but a Card” Challenge! I hope you will join us for a chance to win a $25 gift certificate to the a2zscrapbooking store. Today I have a few gift card holders I made for my stash. These are easy to make and they make the gift of a giftcard a little more special! The red and green ones were made with big Hero Arts background stamp, one was stamped and the other heat embossed in clear to give a tone on tone look. The third background was made by swiping a Hero Art’s ombre ink pad straight down the card stock! I had a lot of fun decorating these with Hero Arts flowers, and stamps and die cuts. Don’t forget, you can use code Angie15 to get 15% off your purchase of $25 or more (excluding shipping) at the a2zscrapbooking store. Categories: Challenges, Embossing, Flowers, Gifts & Gift Wrap, Handmade Cards, Hero Arts, Thank You Cards | Tags: Angie, candy stripe, design team, embellishments, embossing powder, Flowers, gift card, mermaid ombre ink, ombre ink, smitten stamp and cut, Stamp and Cut, Thank You, thank you die, Thanks | Permalink. Hi, friends, it’s Chark here today to show my little gift bag idea using the Boo Stamp & Cut set. I love the Stamp & Cut sets that come with a few stamps and the corresponding dies…so convenient. I used the larger ghost die with vellum and then the small one with orange glitter paper. After I stamped the mini ghosts on the black cardstock, I added some of the face stamps. Fun! Some of the ghost stamps are used with first generation stamping, then some with second and third generation stamping, so I’d get a variety of looks for the ghosts. Here’s a little hint—I used the White Unicorn Ink, which is a fabulous white ink, but it does take longer to dry, so don’t smear yours like I did. The little guy at the bottom looks like he has a headache, doncha think? 🙂 Here’s a close-up of the non-smeared ghosties. If you have the Boo Stamp & Cut, I’d love to see what you’ve done with it. If you don’t have it and want it, it’s only $10.20 in the store right now…look at all these cute face stamps you get with it. And if you like the idea of a smaller stamp set with matching dies all in one set, you can get your own at the store, including this Antlers Stamp & Cut and this Merry Stamp & Cut, each costs $14.95. But, if you have a cart of $25 or more, you can use my super special code CHARK15 to get 15% off your cart! Stamp & Cut sets are just one way to get stamps and matching dies together, we also carry the larger stamp sets paired with their matching dies. These cost a little more because they contain more and bigger stamps and dies. Don’t forget to enter our October Monthly Challenge—Layer It! You could win $25 to the store. That’s all for me today, have a great Monday! Categories: Gifts & Gift Wrap, Halloween, Tags | Tags: boo stamp and cut, chark, gift bag, Halloween, Stamp and Cut, tag, Vellum | Permalink. Hi there, it’s Angie here with a fun quick project that makes a great gift or a fun item to use yourself! It’s a small spiral notebook from the discount store covered with fun paper, stamping, ribbon and gems! For the book on the right, I used Hero Arts “You’re So Lovely” CL949 stamp set with a few inks on some patterned paper, then adhered it to the front cover and back cover of a small spiral notebook. I added a couple of Hero Arts gems and some thin ribbon around the edges to finish it off. For the book on the left, I used some brand new products and an older set. The new products were Hero Arts Forest Scene Stencil SA078 and Hero Arts Candy Stripe Bold Prints Background Stamp CG681. I used the stencil with Hero Arts Ombre Ink in Mint to Green for the top section and the background stamp for the bottom section. I added ribbon and the sentiment was stamped on white card stock is from an older stamp and die set called Hero Arts Handmade Tags DC139. Hope you will take the time to enter our challenge this month here: Color it in! Just remember to use one main Hero Arts product to be eligible to win the $25 gift certificate to the store! Woohoo! and don’t forget, you can use code Angie15 to get 15% off your purchase of $25 or more (excluding shipping) at the a2zscrapbooking store. The new release products are in the store now so have fun shopping! Categories: Clean and Simple, Flowers, Gifts & Gift Wrap, Handmade Cards, Hero Arts | Tags: a2z Scrapbooking, a2z Scrapbooking Store, Angie, background stamp, candy stripe, clean and simple, design team, diamond gems, Flowers, forest scene, Hero Arts, ribbon, Stamp and Cut, stamping, stencil, you're so lovely | Permalink. Hi there. Dawn here to inspire you for this month’s challenge. It’s all about Clean and Simple (right up my alley!) I enjoy CAS but do love to add some texture at the same time. Here is my take on Gayatri’s card. I used some leatherette card stock I picked up when a local stationery store closed. It is the stuff you use for the front cover when you bind papers and was being sold super cheap. I cut the Spellbinders tag out of it as well and did a pad to paper technique with Walnut Stain distress ink. 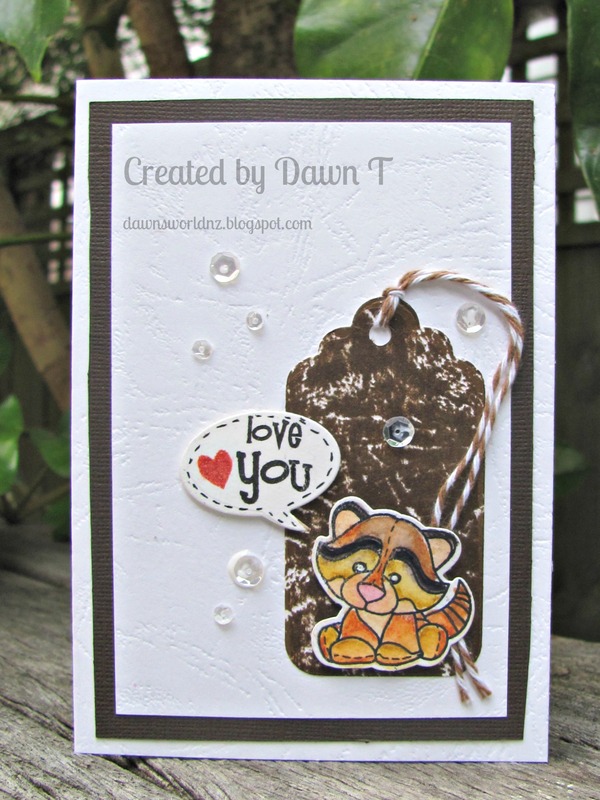 My little cutie is from Baby Animals Stamp and Cut as is the sentiment which I cut with a Penny Black die (Chat Bubbles) and added the dash line. My little animal was coloured with Derwent Inktense pencils and an aqua brush. Finished with some Pretty Pink Sequins. Remember if you are in need of any items from the a2z Scrapbooking store you can use code Dawn15 at checkout to receive 15% off your purchase of $25 or more. (before tax and shipping) And don’t forget that we are on Twitter, Instagram and Facebook. Follow us on these different social media outlets so you won’t miss out on any fun promotions! Categories: Challenges, Coloring, Handmade Cards | Tags: a2z Scrapbooking Store, CAS, die cuts, Stamp and Cut, Watercolor | Permalink.